2018 Medicare Open Enrollment started a few weeks ago, on October 15th. Which means, if you need to adjust your Medicare plan you will have until December 7th to shop, compare, and join a 2019 plan. 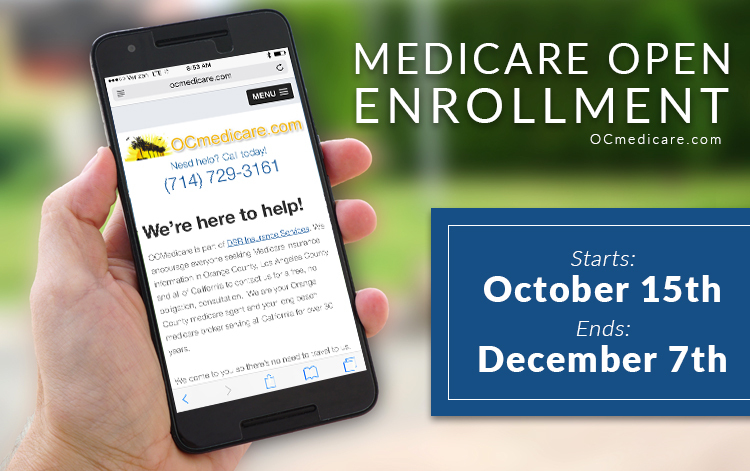 What can you do in the medicare open enrollment period? – Transition from regular Medicare coverage to a Medicare Advantage Plan (or vice versa). – Drop one Medicare Advantage Plan for a different Medicare Advantage Plan. – Join a prescription drug coverage plan, Part D.
– Change your coverage between one Part D plan to another. – Relinquish your Part D coverage. Stay on top of changes by reviewing next year’s Medicare & You Handbook. Know in advance what your Medicare costs and benefits for the upcoming 2019 year will be. If you are unsatisfied with your coverage, this open enrollment period is your chance to make changes, they will take effect January 1 of the next year. You are not alone! Choosing a medicare plan can be a daunting process. If you decide you need a little help a Medicare insurance agent is a great choice. It’s always a good idea to talk to a Medicare adviser about your particular situation. We provide a no obligation free consultation! We’ve been helping people just like you for over 30 years and feel confident that we can help you make the best decision for yourself regarding your Medicare Insurance needs. Need some advice? Learn about Tips For Choosing A Medicare Plan.